Santa Monica, California (April 23, 2018) – Today Atom Tickets, the social movie ticketing platform, announced that it has secured nine new exhibitor partnerships including Harkins Theatres, the fifth largest theater chain in the United States. Additional leading exhibitors that have agreed to enable Atom Tickets at their locations include New Vision Theatres, Santikos Entertainment and Regency Theatres. Regional exhibitors have also signed on including O’Neil Cinemas and Zyacorp Entertainment’s Cinemagic Stadium Theaters (New England area), WYO Movies (Wyoming), Starlight Cinemas and CGV Cinemas (Los Angeles area). The new exhibitors add more than 1000 screens to Atom’s platform, bringing Atom’s total reach to over 20,000 screens of the highest volume across North America. Harkins Theatres is a privately-owned and operated business, founded and based in Arizona since 1933. With 34 locations in 5 states, Harkins Theatres is the 5th largest theatre chain in the United States. With 85 years of colorful history, Harkins Theatres remains the Southwest’s premier entertainment company. New Vision Theatres was established in 2017 as a leading movie theatre circuit of 17 locations across the U.S., with 194 screens. The new circuit is a diversified portfolio of theatres that focuses on first-run movies and offers a range of amenities, including IMAX, 3D, luxury seating, extensive food and beverage options, dine-in services, alternative content and cinema events. Regency Theatres was founded in 1996 by brothers, Lyndon and Andrew Golin with a theater in Camarillo, California. Family owned Regency Theatres operates 28 locations in Southern California including the iconic Bruin and Village locations in Westwood Village, California. Zyacorp’s Cinemagic Stadium Theaters is a family-owned and operated New England theater chain. Founded in 1998 by Mark Adam, Cinemagic’s family serves the communities of 3 states with 8 locations and 91 screens. Cinemagic Stadium Theaters offers its patrons an array of amenities; home to the only IMAX locations in New Hampshire and Maine, luxury seating, 3D, sensory & family friendly screenings and alternative content. These exhibitors join an already impressive list of theater partners that includes AMC Theatres, Regal Cinemas, National Amusement’s Showcase Cinemas, and Southern Theatres among others. These recent partnerships are expected to be available to moviegoers in the coming months. Atom Tickets is the first-of-its-kind social movie ticketing app. 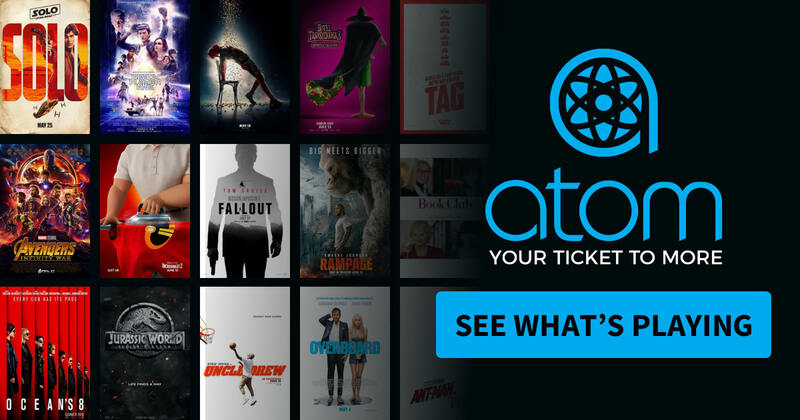 Backed by Lionsgate, Disney, Twentieth Century Fox Film, and Fidelity Management & Research Company, Atom Tickets allows consumers to search for films instantly, invite friends, buy tickets, pre-order concessions and more. Enabled on over 20,000 screens across the U.S., the platform’s innovative marketing capabilities help studios, exhibitors and brands maximize revenue opportunities. Atom Tickets is available as a free app in the Apple App Store and the Google Play Store and online at atomtickets.com.